MOSCOW--(BUSINESS WIRE)--Jun. 28, 2018-- Visa (NYSE: V), the Official Payment Services Partner of FIFA, today released an analysis of foreign travellers’ spending during opening days of 2018 FIFA World Cup™. The results found that in the 11 Russian host cities of the tournament, approximately one in every five (17 percent) purchases with Visa used contactless payment technology, including smartphones, bracelets and rings. In the stadiums themselves, the share of contactless payments was 54 percent, inclusive of purchases made by fans from Russia and abroad. On average, across the 11 host cities, Visa cardholders spent 3,575 rubles (approximately $56.65)1 per transaction, with fans from the United States spending the most – followed by China and Mexico in second and third, respectively. Overall, a majority of purchases in host cities fell into the lodging, fashion and restaurant categories. Luzhniki Stadium led all venues for total number of payment transactions, where fans spent 139 million rubles ($2.2 million) - of which 71 million rubles ($1.12 million) came from non-Russian citizens and 68 million rubles ($1.1 million) from Russian citizens. The opening match between Russia and Saudi Arabia on June 14 -- where fans from 123 countries filled the stadium -- saw the highest volume of payment transactions. The June 17 match between Germany and Mexico saw the second highest volume of transactions. The average in-stadium transaction amount for all matches during the first five days of tournament play was 1,682 rubles ($26.66). Additionally, Russian fans made twice the amount of transactions for food and drinks compared to non-Russian fans, however, the average per-transaction amount for non-Russian attendees was 1.5 times higher than Russian purchases in those categories. 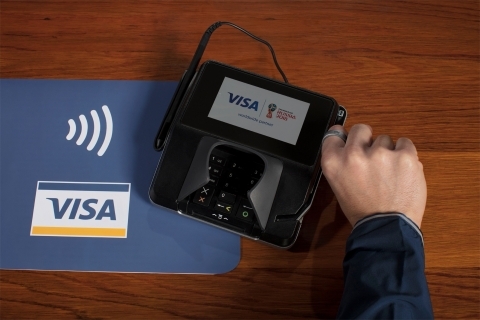 For the 2018 FIFA World Cup Russia™, Visa is the exclusive payment service in all stadiums where payment cards are accepted. In-stadium, fans can pay with contactless Visa credit and debit cards and mobile payment services at the more than 3,500 point-of-sale terminals and 1,000 mobile concessionaires that have been equipped with the latest in payment innovation. 1 Transactions were analyzed on Visa cards issued by foreign banks, which were made in 11 host cities of the 2018 FIFA World Cup™ for the period from June 14 to 18, 2018, inclusive.